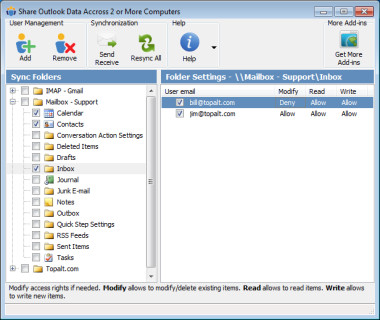 Use Altsync for Outlook to synchronize, share Outlook folders on multiple PCs in an easy way. No server is required. Synchronize, share all types of folders (calendars, contacts, emails, journals, notes and tasks). Automatically transfer all changes using only e-mail account. Just add email addresses which should receive the folder and you are all set-up. No extra work is required. FREE edition available.